2012 December « GASTHAUS: got 'kraut? Viki, Olga, Oxi and Marina, from left. We are now closed for our annual Christmas Break. Until then, we wish you a Merry Christmas and a Happy and Healthy New Year!! Still looking for that last-minute gift? We are still selling gift certificates before we close for our Christmas Break Saturday evening. Feel free to call us at 502-899-7177 if you are coming before 6pm Saturday (doors open at 6pm), we will gladly let you in and issue your gift certificate. It’s hard to believe that it’s already been 19 years since we first opened!! We had our “Grand Opening” on December 18, 1993. I’m putting “Grand Opening” in quotes, because in the days before social media we really didn’t make a big deal about it. It was a real quiet affair. No announcement, no big flashy banner. At one point during that day, our first customer came strolling in. It was Ingeborg Chandler, a German living in the US. She bought some deli meats from us, because back then we still had a deli counter. Imagine us at the front of the restaurant making deli sandwiches! We even had the menu written on a chalk board hanging on the wall above. Boy, things sure have changed! Our first customer, Ingeborg Chandler, buys some deli meats from Chef Michael. None of us really knew what we’d become in the years ahead, and no one knew how much work and commitment to the business was required. But somehow we’ve made it this far and we hope to stick around for a little while longer. We love our customers, we really do. That’s why we already have a cool idea for our 20th anniversary, so please stay tuned. But we also love our staff and would like to take this opportunity to say “Thank You staff for your loyalty and hard work”!! Accordion Music on Dec 13 and Dec 20! 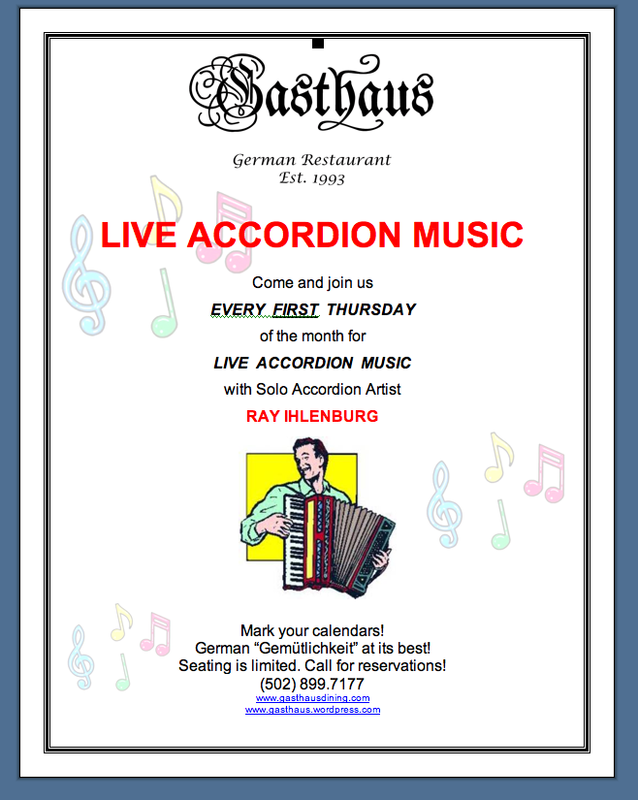 Ray will be playing his accordion at the Gasthaus on Thursday, December 13 and Thursday, December 20. Please call 502-899-7177 for reservations! Creamy Soup made with a blend of melted cheese, ground beef and fine chopped mushrooms and onions. Red Skinned Potatoes with Red Onions, Peas, Pickles, Carrots and Smoked Pork Sausage tossed in a Homemade Sour Cream Dressing garnished on a Bed of Salad with Tomatoes. Accodion Music – Tonight, Dec 6! !